1. Handy Du’as - Begin with a Bismillah! We should remember Allah at all times during our travels, especially before beginning a journey in which there are many du’a (supplications) from the Prophetic ahadith that we should make. One handy way to have these du’as on you at all times is to download an app for your phone called “myDuaa: Fortress of a Muslim” (Paid App) which contains all the du’as of the popular little book of the same name. You could carry along that book with you, but this app is an organized way of finding the du’as you need quickly and efficiently. It features categories for each type of du’as, and for each du’a it shows the original Arabic, a transliteration, and the translation, along with a playable audio! For a few bucks this app has become part of our travel routine, taking it out and reading it in the airport before we leave, and reading it again back at home. If you’re going for Umrah or Hajj, this app is INCREDIBLY valuable, and we have used it almost constantly as an alternative to taking along a book with you. Another app I recommend for Umrah and Hajj is called Salam, co-created by Sh. Muhammad Alshareef. Check it out on iPhone or Android. If you are looking to buy large luggage for checking-in or smaller carry-on luggage for your upcoming trip, DO NOT buy cheap luggage with (2) inline wheels! Instead, buy luggage with (4) spinner wheels (which do come cheap these days!) which makes walking around in the airport or outside so much easier! Luggage with the 4 spinner wheels allows you to walk with your luggage beside you, not behind you, and allows you to maneuver around lines, elevators and escalators, and on the streets much easier. If it’s a good quality luggage, it will require less strain on you to pull or push the weight of the luggage compared to the 2-wheel inline type of luggage, which requires you to pull behind you, having you feel the weight constantly. 3. Packing Cubes - Keep your Hijabs Tidy! Everyone has a different style of packing for a trip, however one handy item that I use for packing my clothing is a set of packing cubes! They are zipper-closed bags made out of a lightweight material of different sizes so you always know where to find a specific clothing item. I put all my hijabs rolled up in one packing cube to keep them neat, and each category of different clothing in the others. I bought mine on Ebay from a seller like this one. 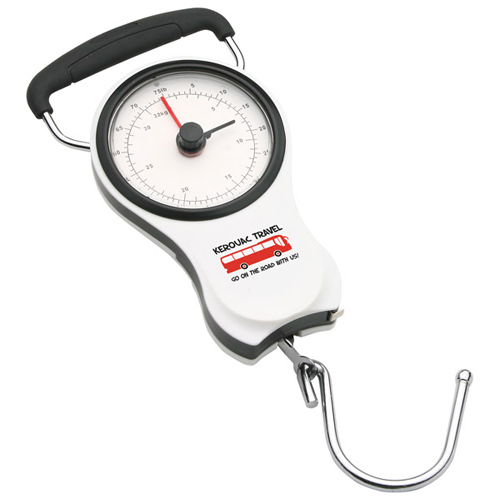 A super handy item to have at home and while abroad, a portable weight scale allows you to know your luggage weight right away before heading to the airport so you can sort or repack your luggage at home or in your hotel. It works by inserting the hook into the handle of your luggage and lifting it up to weigh it. I got mine at Walmart. Click here to check it out. If you’re visiting a non-muslim country, it always helps to know where to find halal food.Alhamdulilah Zabihah.com has made this easy for us with their awesome website, but you can also download their app, too! Recently on our trip to the US, we didn’t know where to find food in Washington, so we pulled up the app and located a few halal places nearby right away. Just make sure and read the reviews left by other people, and give the restaurant a call to make sure they’re still in business and not closed for the day. Download for iPhone. or Download for Android. Alhamdulilah, Allah has made prayer easy for travellers and you can often delay your prayers to a time when you are in a mosque or at home, however sometimes prayer time comes while you are out and about and you must be able to pray anywhere, from the airport gate to a park outside! For Muslim travellers, a travel-size Prayer Mat is a must-have item, which you can easily keep in your purse or in your pocket. You can find these in most Islamic Bookstores or in Masajid. Women or Men, if you’re travelling a lot, you need a comfortable and secure bag in which you can keep your passport, your money, and all of your items safe and close to you at all times. For myself, I wanted a cross-body bag in which I could place a water bottle for walking around, had a wide strap that wouldn’t hurt my shoulders, and had enough pockets so that I could keep my important documents safe. After searching around, I found a variety of durable anti-theft bags that I thought would be perfect for travelling around the world, and purchased a bag for that purpose online. I liked it so much that I now use it as my regular purse! Next Top Travel Tips Coming Soon: Passing through Airport Security Efficiently andHassle-Free! JazakiAllahu khairan! :) Everything here is super useful and I use them all every time I travel, except perhaps the Zabihah app if we're not in North America, as the reviews are sometimes outdated and you'll sadly find restaurants closed down sometimes.